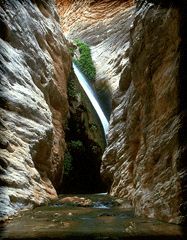 "May all your trails be crooked, winding, lonesome, dangerous, leading to the most amazing view...where something strange and more beautiful and more full of wonder than your deepest dreams awaits you." 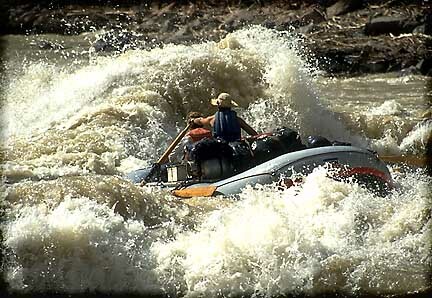 A row boat has a wild run in Hermit Rapid. 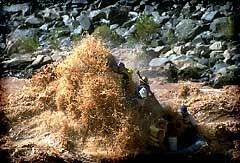 This rapid often has the tallest waves in the Grand Canyon. A memorable ride! 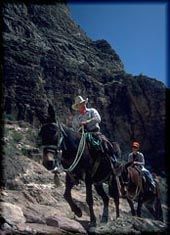 Exploring the side canyons is a highlight of any Grand Canyon trip. 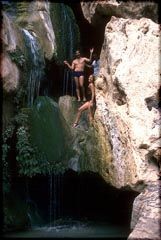 This waterfall is a three mile hike from the Colorado River, up Stone Creek, River Mile 132. 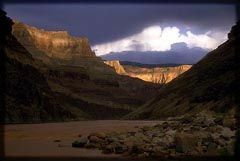 Traveling down the Grand Canyon during the rainy season (late July and August) may provide the chance to see dramatic storm lighting on the cliffs, and gorgeous thunderhead clouds. A bighorn ram feeding along the river's edge. 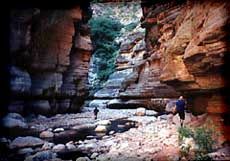 Hikers walking through Redwall limestone narrows in Kanab Creek, a major tributary of the Colorado River at Mile 143.